Should you switch banks or exit liquid mutual funds? Your bank balance is about to get a boost. Effective 25 October, the Reserve Bank of India (RBI) deregulated the savings bank account interest rate. In simple words, every bank is free to fix the interest rate it wants to pay on savings account deposits, compared with the standard 4% that they were mandated to pay till now. Soon after the deregulation announcement, three private banks raised savings account interest rate to 6% per annum for balances above ₹ 1 lakh and 5.5% for deposits less than ₹ 1 lakh. RBI has told the banks to pay a uniform rate to all customers having savings account balance of up to ₹ 1 lakh. For balances above ₹ 1 lakh, banks are free to choose interest rate bands. For instance, one bank may pay a higher savings rate to all customers with a savings account balance between ₹ 1 lakh and ₹ 3 lakh, while another may pay the same interest rate for savings account balance between ₹ 1 lakh and ₹ 5 lakh. Many financial experts believe that it’s unlikely that customers would switch banks anytime soon, purely on account of higher interest rate. Moreover, if you have a salary account (your monthly salary comes in your bank account every month) or your bank account gets debited every month towards your loan commitments or even for utility bills such as electricity or telephone bills, changing a bank account can get tedious. Also, the average Indian consumer has till now shown little interest in moving funds from one bank to another. This could be on account of long-standing relationships or simply the lack of any real need to do so. Says, Pawan Joseph, vice-president, Motilal Oswal Wealth Management Ltd, “High networth individuals anyway move surpluses to liquid funds. In the case of retail customers who are not conscious about wealth management, a very small amount will shift. Moreover, the relationship with the bank and tied-in financial transactions are difficult to change." Do they match up with liquid funds? Rising interest rates for the past two years have meant— among other things—that your liquid funds’ returns have been attractive. Between June 2011 and now, liquid and ultra short-term funds have offered about 7-7.5% return per annum. Further, dividends in liquid funds and ultra short-term funds are taxed at 27.04% and 13.52% (including surcharge and cess), respectively, compared with 30.9% at which your savings bank account interest is taxed, assuming you are in the highest tax bracket. A back of the envelope calculation shows that investments in liquid and ultra short-term funds would outperform saving bank interest rate if you are in the highest tax bracket. Should you, then, continue with your systematic transfer plan (STP; putting a lump sum in liquid or ultra short-term fund and then switch systematically to an equity fund)? “It’s a smarter strategy to remain with a liquid fund and do STP in an equity fund. Putting money in liquid funds give higher returns to investors compared with putting money in bank savings account. It’s much easier also", says Puneet Pal, senior vice-president and fund manager (debt), UTI Asset Management Co. Ltd. “Liquid funds are still giving up to 9%, but the new savings bank rate offered is just 6%. So the difference is still huge," says Murthy. Not all banks have raised the rates. Banks that have raised rates, such as Yes Bank Ltd, Kotak Mahindra Bank Ltd and IndusInd Bank Ltd, have relatively fewer savings accounts and hence, may be looking to attract customers who are getting lower interest rates. Though for these banks, there will be an additional cost. If and when other banks will follow is yet to be seen. Says Pathik Gandotra, head - equities, IDFC Securities Ltd, “This is a good reform, but it will take time to play out. Public sector banks are unlikely to raise rates now as there is no reason or scope to do so." Large public banks have said that they aren’t in a hurry to raise rates. For State Bank of India, which has the largest deposit base, a 100 bps increase in savings rate can potentially increase their annual interest expense (for the rest of the fiscal) by 4-5% or ₹ 1,400-1,500 crore. According to Gandotra, this can translate to a 15 bps or so reduction in net interest margin (NIM), if loan rates don’t rise. For a bank, NIM is essentially the difference between the total interest earned and total interest paid as a percentage of total assets and it shows the average margin a bank makes by borrowing and lending funds. While this reduction may not be significant in itself, given the difficult economic environment, it will pinch the large banks. Even for private banks such as ICICI Bank Ltd and HDFC Bank Ltd with large deposit base, the effect on annual interest expense (for the rest of the fiscal) can potentially be between 3% to 5% increase. Ashvin Parekh, partner, national leader–global financial services, Ernst and Young, says: “Those banks which have an efficient cost management mechanism will be able to announce higher rates. For larger banks (large deposit base) owing to their expanse business costs are high and likely to stop them from making immediate changes to the savings rate." It’s a given that banks that raise savings rate and incur additional costs are unlikely to absorb it and will pass it on to consumers. Says Parekh, “In the short to medium term, especially for larger banks, higher rates are a disadvantage and (if raised) they will try to recover costs from rebalancing CASA (current account and savings account) and (increasing) lending rates. In the long term however, they will benefit the most." Incidentally, Kotak Mahindra Bank has revised its benchmark prime lending rate and base rate upwards by 25 bps with effect from 1 November. Banking experts say that banks paying higher rates will offer minimal benefits while low savings rate bank accounts might offer more benefits. What this means is that if you are getting 6% interest on your saving account, keep an eye out for the need to maintain a higher minimum balance, higher charges for cheque books, “outstation cheque" clearances, inter-bank transfers and so on. Says Gandotra, “If banks are forced to raise rates (due to competition) there are going to be charges for everything; cost of service will go up as large banks will try to match each other. This hike (in savings rate) is not going to lower profit." However, Manian confirmed that at Kotak Bank they are not looking at increasing any charges (linked to savings account) as the bank is well placed to address increased costs and service requirements. Experts also feel that product innovation will happen as banks get competitive with their savings rates. We might see a range of savings accounts with varying benefits linked to the interest offered. Says Parekh, “(As an example) where banks have an asset liability mismatch, the current 6% rate offer may last 6-12 months, after which there can be a requirement for the customer to mandatorily have a term deposit. Such hybrid products can undesirably push up the yield curve." Asset liability mismatch for a bank occurs when the overall term on their advances and deposits are not in harmony. For example, ideally long-term advances of a bank should be serviced by long-term deposits. Where this is not the case, banks focus on shoring up appropriate deposits (long-term or short-term) as per their need. So don’t be perturbed when you see your bank offering a 150-200 bps lower return on your savings account. If you have to open a new account then don’t take only the savings account rate into consideration, but look at the services it offers and charges. Also, remember that a deregulated saving account rate means that if rates can be higher now they can potentially be lower in a different market environment. 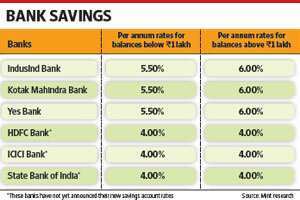 Though such repricing of savings account rates will not be a frequent affair, it will follow market rates. Just like fixed deposit rates move up and down depending on policy rate, the savings rate will also adjust. That’s not all, Parekh also believes that the current higher savings rate of about 6% announced by a few banks seem to be something that the medium-sized banks have just “benchmarked or flagged off the rate" for the time being. He adds: “But the market may not really move around or stabilize that rate. What may happen is that once the large four-five banks announce their new savings rate, perhaps they may not go all the way up by 175 bps or 200 bps as the first movers have. My impression is that they might increase their savings rate by 50 bps to utmost 75 bps. In which case, overall the savings rates may come down a little bit." We suggest you stick to your liquid and ultra short-term funds to park your surplus cash. But at the same time, a deregulated savings rate should spice up your savings bank account.